We especialize in minimally invasive and robotic surgery. This means you will feel less pain, get better sooner. Hernia repair has been around for a long time. That means traditional techniques have been perfected while new options and materials have been developed. While not every technique is right for every hernia, they all have common goals: to provide the strongest repair and least chance of recurrence with the least possible discomfort and quickest recovery. Today's hernia repair options include new techniques and materials that can make surgery less invasive, recovery faster and recurrence less likely. And the smaller your hernia (meaning the earlier you fix it), the more options you're likely to have. Domingo E. Galliano, Jr., MD, FACS, FASCRS, has received advanced training for a minimally invasive procedure known as reconstruction of the abdominal wall, or complex abdominal wall reconstruction. Dr. Galliano can use the advanced surgical technique to provide a solution. Recently, he held a screening session for hernias where half a dozen patients who attended were suffering with these specific types of hernias. Some were candidates for complex abdominal wall reconstruction. If you are suffering from recurrent hernias and are unsure where to go; if you have been turned away by hospitals and surgeons; if no one else has been able to help you, then you may be a candidate for complex abdominal wall reconstruction. 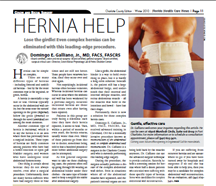 If you have a hernia, or feel you may have one, contact our office inmediately. Hernia surgeries are routinely performed as a laparoscopic procedures, so the recovery time is much less than it used to be. Most patients are treated as an outpatient, have the surgery, and are released the same day. A very large percent of hernia surgery patients return to regular activities within a week of surgery.